Discus are one of the most prized and respected fish in the hobby – and for good reason. Their amazing colors, docile nature, and exclusive price tag make them the holy grail for most fishkeepers. That said, Discus don’t have to be kept in species-only tanks. In this guide, we dive into 9 of our favorite Discus tank mates and explain why they make great picks. 1 Are Tank Mates Really Necessary? Are Tank Mates Really Necessary? So, why do many aquarists choose to keep their Discus with other fish species anyway? We’d like to start out by saying that tank mates are not a must in your Discus tank by any means. In fact, a Discus-only aquarium looks fantastic and might actually be the best way to start out – especially if it’s your first time keeping discus. Less fish means less possible issues! That being said, keeping some well-selected tank mates with your Discus does offer an important advantage. Discus are known for being quite shy and easily spooked. Dither fish (like schools of tetras) can help your Discus feel safe and show themselves more. After all, if a school of prey fish like Tetras are swimming freely, that’s a good indication that there are no direct dangers present for the Discus either. If you want to keep your Discus with other species, keep in mind that not all fish will work. In fact, most won’t! You’ll have to select tank mates very carefully to avoid any issues. It’s a good idea to take the Discus as a starting point and build the rest of your stock around them, not the other way round. 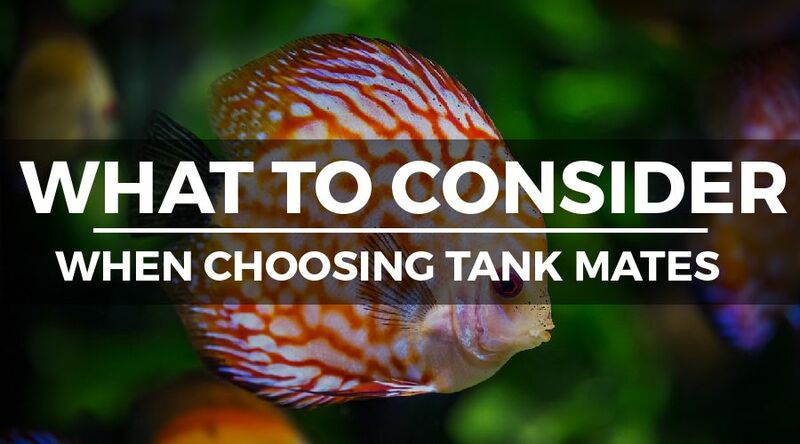 Don’t make the Discus conform to your other fish, as they have specific requirements that might not be properly met in regular community tanks. If you want to combine two fish species, their requirements when it comes to water temperature (and water values) have to match. Discus naturally inhabit rather toasty waters in the Amazon basin and they like their aquarium water a lot warmer than most other popular species. This can make selecting tank mates difficult: fish that naturally hail from cooler areas won’t do well in warm Discus tanks in the long run. Stick to species that prefer similar temperatures to avoid any problems. The “temperature problem” applies equally to water values. The Amazon waters naturally inhabited by your Discus are quite soft and acidic. You’ll have to replicate this in your aquarium, which excludes many possible tank mates that prefer harder or more basic water conditions. Note: If you want to condition and soften your water naturally, I highly suggest throwing a few Indian Almond Leaves into your Discus tank. Almond leaves also help give you water the biotype tint that Discus love. 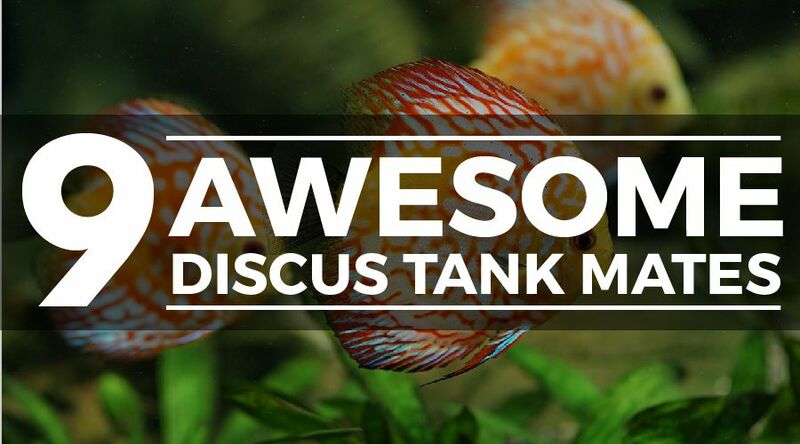 If you’ve ever kept Discus before, you’ll know they are definitely not the most assertive cichlids around. They are very calm and, as mentioned before, can actually be rather shy. Hyperactive, aggressive or territorial tank mates can easily stress them out. Calm and peaceful are keywords when it comes to selecting fish to combine with your discus. This issue applies whenever you’re trying to put together a suitable stock for your tank. The aquarium has to be large enough to accommodate all the fish you want to keep comfortably. If you’ve gone for the bare minimum to keep your Discus happy, you might want to consider skipping the tank mates altogether to prevent overcrowding (or stick to a maximum of one small species). Crowded fish are stressed fish! Bad water quality can become a real problem in overstocked tanks, which can easily lead to issues with your very sensitive Discus. Some aquarists like to keep things as close to nature as possible in order to provide an ideal environment for their Discus. This involves setting up a biotope tank that closely mimics the Discus’ natural dark-watered Amazon habitat and only selecting tank mates that they might naturally encounter. How strict you are when choosing tankmates depends on your own preferences, but species from entirely different continents or habitats are obviously out of the question if you’re going the biotope route. What we can conclude from the guidelines above is that you can’t just keep any fish with your discus if you want things to go smoothly. Confused by all the “rules and regulations”? Don’t worry, there are still quite a few options out there. The list below contains 9 of the best Discus tank mates out there – all are peaceful, calm and suitable for beginners. Although all Corydoras varieties would be a good discus tank mates temperament-wise, we like Sterba’s Corydoras (Corydoras sterbai) because it’s a relatively large species that tolerates higher temperatures. Cory catfish are among the most popular tank mates for Discus for a few reasons. First off, they reside in an entirely different water layer. These are bottom feeders that love to sift through sandy substrate in search of any tasty morsels that your discus might have overlooked. They perform these cleaning duties without ever bothering the discus. 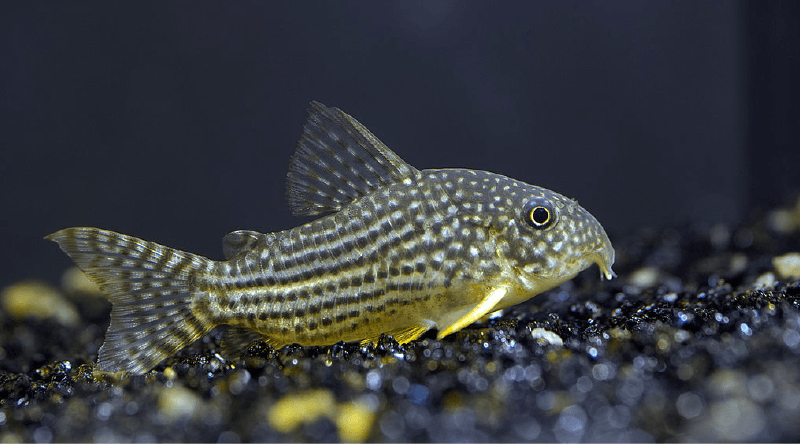 Another advantage is that they’re quite sturdy: Corydoras are also known as ‘armored catfish’ and won’t easily fall victim to an overly curious discus. If you want to keep Corydoras Sterbai with your Discus, be sure to get a school of at least 6 of them. Because Discus aquariums have to be large, you’ll get away with a large group – be sure to take advantage of this so you’ll be able to see the Cories’ natural behavior. An Amazon biotope set-up works well for both Corydoras sterbai and Discus, so get to work with the leaf litter and driftwood! Hatchetfish are a fascinating species that lend their name from their unusual body shape. All hatchetfish are commonly kept as tank mates for Discus, but we’ll be focusing on the particularly popular marbled hatchetfish here. As with Corydoras sterbai, hatchetfish make great Discus tank mates because they inhabit a different water layer. The two species won’t get in each other’s way: hatchetfish rarely leave the surface and are extremely peaceful. If you want to keep marbled hatchetfish in your Discus aquarium, a blackwater set-up will work well. The hatchetfish appreciate plenty of overhanging vegetation and hiding places while discus fish prefer a quite a bit of free swimming space, so you’ll have to get creative with decorations to please both. Floating plants are a great option to help the hatchetfish feel safe. 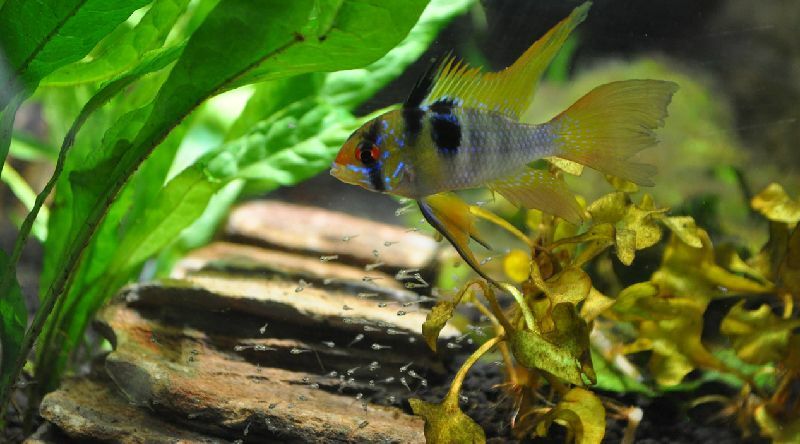 Get a group of 10 or more fish to encourage schooling behavior. 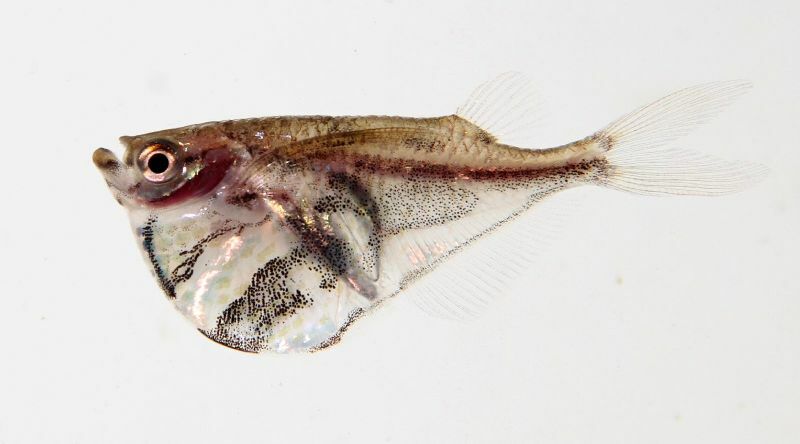 One point about hatchetfish that has to be noted is their acrobatic skill. These fish are jumpers, especially when something startles them. If your aquarium doesn’t have a lid you might want to skip this species as they will undoubtedly jump out sooner or later. There are multiple tetras we love for Discus tank mates (and unfortunately we can’t discuss them all, so we’re limiting ourselves to the ‘classics’: Rummynose tetras and Cardinal tetras). Rummynose tetras are probably the most popular middle water layer schooling fish to combine with Discus. At around 2”, they are large enough to avoid falling prey to a hungry Discus. In addition, their friendly temperament ensures stressless cohabitation. As we discussed earlier this is important because discus fish are pretty prone to stress. Although slightly lower temperatures are usually recommended for Rummynoses than Discus, hobbyists have found that the tetras usually do just fine in their warm Discus tanks. Interestingly, some aquarists like to keep Rummynose tetras with their Discus because they are an easy indicator of water quality issues. Their red noses turn pale when they’re stressed from bad water quality. Considering how expensive and sensitive discus fish are, this early alert can come in quite handy. 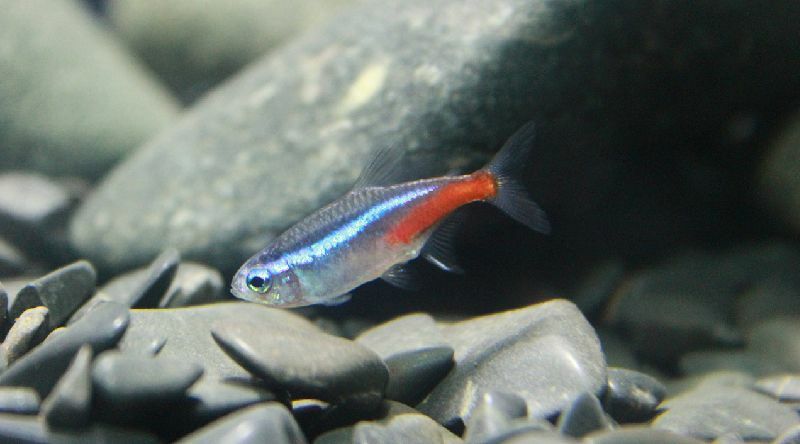 Like many of the other fish on this list, Rummynose tetras look and feel their best when kept in groups. 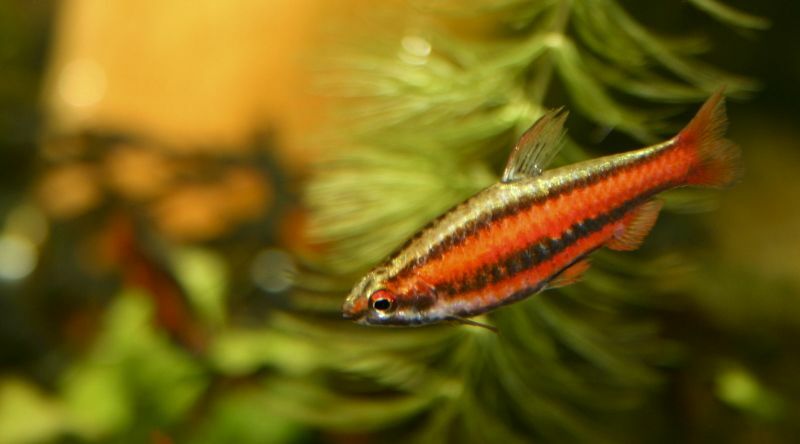 The more the better: consider going for 20 or more of these red-nosed tetras. Considering adding Neon Tetras to your Discus aquarium? You might want to switch that to Cardinal Tetras instead. They are similar in color but slightly larger, which means less risk of “mysterious disappearances”. After all, adult Discus definitely won’t pass up a tasty Tetra if they manage to catch it. Like Rummynose tetras, Cardinals are peaceful and easy to keep. Their shimmering red, blue and silver coloration compliments the discus beautifully and you’ll see them schooling tightly due to the presence of the larger fish. Like Discus fish, Cardinal tetras do well in a dark South-American biotope set-up, so you won’t have to switch up your tank decor if you’ve already gone the blackwater route. Overhanging vegetation, floating plants, leaf litter and driftwood are the keys to keeping both your Cardinals and Discus happy. Just be sure to also leave some swimming room! The combination of L-number catfish (also commonly known as Plecos) and Discus fish is a somewhat debated one. The discussion is caused by the fact that some types of Plecos will see the discus’ thick slime coat as a tasty meal. They latch onto the relatively slow discus and attempt to rasp off the slime coat, leaving their victim wounded. This being said, many aquarists have had no issues with combining Plecos and Discus. The secret? Go for one of the dwarf Pleco species, not larger ones like the Common Pleco or Sailfin pleco. Bristlenose Plecos, Zebra Plecos and Orange Spot Plecos stay quite small and actually make great tank mates for Discus. Although Dristlenoses are often reported to prefer cooler temperatures, Discus keepers have found they will tolerate Discus temperatures as long as things don’t get too toasty. Note: Plecos can’t survive on leftovers alone. Additional feedings of algae wafers is highly recommended to keep your Plecos happy and healthy. Need a clean-up crew for your Discus tank? 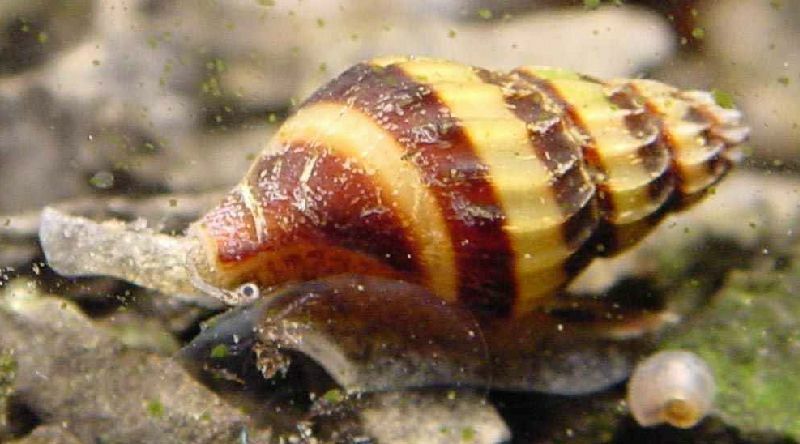 The carnivorous Assassin Snail doesn’t just eat other snails, it’s also a scavenger that will happily consume any other meaty bits it comes across. A group of these can really help in removing any leftover foods that your Discus have missed and thereby prevent water quality issues. One thing you’ll have to keep in mind if you’re interested in keeping Assassin Snails in your discus tank is that snails naturally do better in a somewhat higher pH and harder water than your Discus. Very low water hardness can cause shell deterioration, so be sure to supply some calcium-rich foods as counterbalance (I suggest Hikari Crab Cuisine, but raw Zucchini also works). Keep the temperature on the lower end of your Discus’ preferred range. If you’re looking for an additional pop of color in your Discus tank, why not consider adding a few German Blue Rams? These dwarf cichlids are amazingly colored and generally peaceful enough to combine well with your discus. Although breeding rams can occasionally display some overly assertive behavior, most discus keepers report no issues in combining the two. If you want to combine German Blue Rams and Discus, be sure to provide plenty of cover towards the bottom of the tank. The Rams like to form their own little territory and a few flower pots or caves can make a great place to do so. Other than that, you can stick to the blackwater feel for both Rams and Discus: plenty of leaf litter and driftwood will work well for both species. Be sure to keep the water quality high at all times. Tired of tetras? We get it, they’re everywhere. Luckily the previously mentioned Rummynose and Cardinal Tetras aren’t the only schooling fish species that you can combine with your Discus. 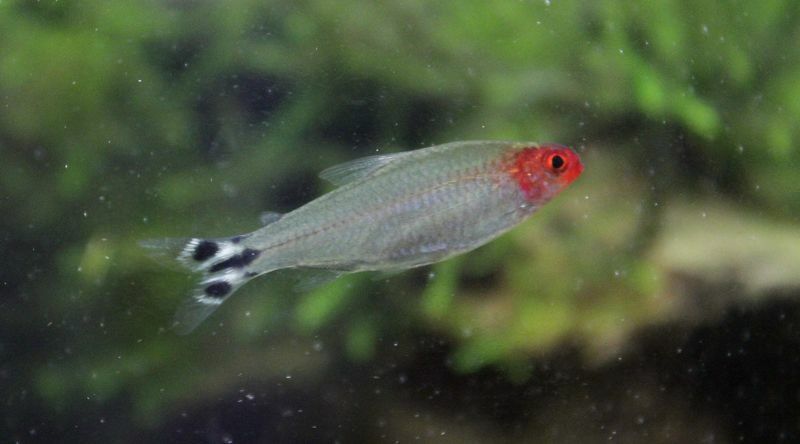 The less commonly chosen Beckford’s Pencilfish (as well as other Pencilfish species) are also great options because they are peaceful and should grow large enough to avoid being eaten. They usually prefer a slightly higher water layer than Discus and temperature shouldn’t be much of an issue as long as you stick to the lower end of the possible range. Beckford’s Pencilfish, like Discus, love a darkwater aquarium with plenty of driftwood and some floating plants with long roots for extra cover. They can be a little skittish, especially if your group is too small, so be sure to get as many of these colorful little fish as you can. Like the idea of keeping catfish in your Discus tank but want a species that’s a little fancier than regular old Plecos? We love the elegant Royal Whiptail Catfish with its elongated body and large fins. Its peaceful nature makes it a suitable tank mate for Discus; the two won’t get in each other’s way because the whiptail catfish spends almost all of its time attached to surfaces like driftwood. As with Plecos, keep a slightly closer eye on your Royal Whiptail Catfish than you would some other Discus tank mates. The chances of this catfish considering your discus’ slime coats a tasty snack are pretty slim, but we’d rather be safe than sorry! 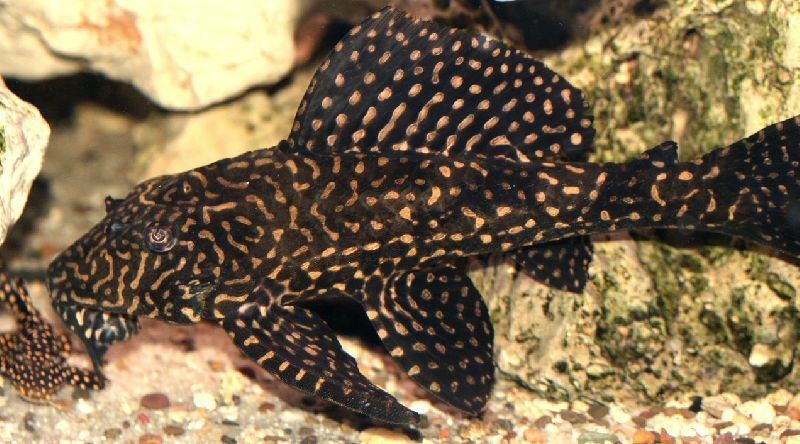 Royal Whiptail Catfish are sensitive to bad water quality, which shouldn’t be much of an issue considering Discus also require top-notch water conditions. If you’ve done some research on the best Discus tank mates, you might have come across sources suggesting Angelfish. However, we’re not big fans of the combination. While these two elegant cichlid species look amazing in an aquarium together, their temperaments are not a great match. 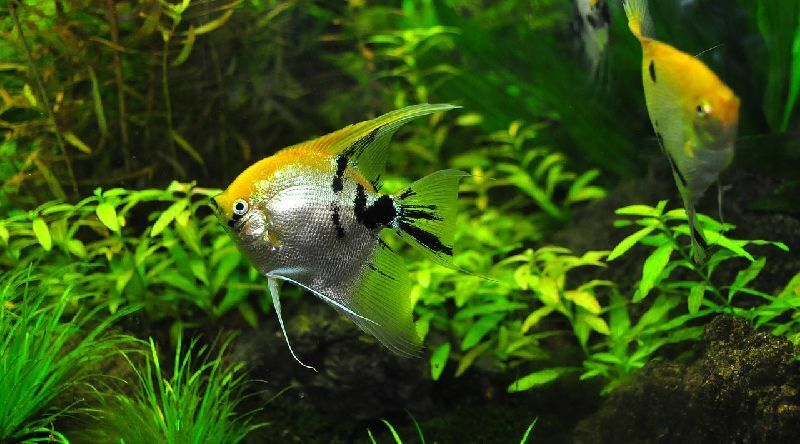 Angelfish are quite a bit more feisty than Discus and can end up stressing out their tank mates. This especially applies if the Angelfish happen to pair up and start their breeding process, as they can become quite territorial. Feeding time can also be difficult, with the more assertive angels outcompeting your Discus. The result? Stressed Discus. Stressed fish have a lowered immune system, which can easily lead to illness and other issues. We’re fans of Clown Loaches and fans of Discus, but we’re not a fan of these fish together…at all. Why? Well, first off, Clown Loaches are a widely misunderstood species. Contrary to what many aquarists believe, they grow very large and need a very roomy aquarium. In fact, they need much larger tanks than Discus! 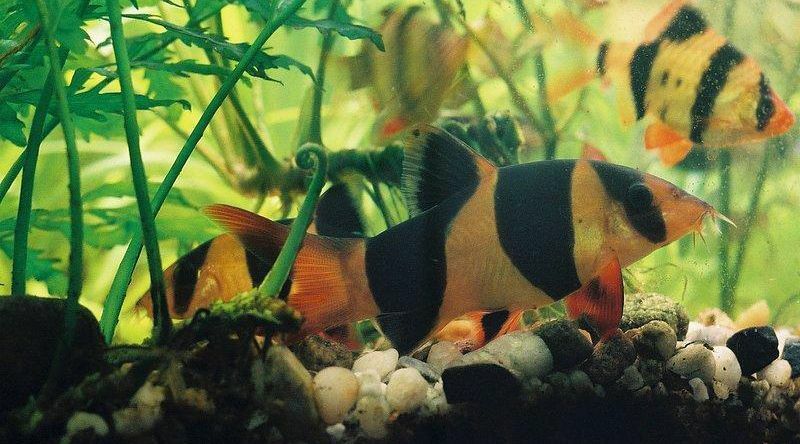 Additionally, Clown Loaches are very active group fish that don’t combine well with calm tank mates like Discus. They grow more assertive as they age and should only be kept with sturdy species that don’t mind their hyperactive behavior.